African filmmakers are often described as cinematic griots, continuing the oral tradition of the African griot via visual storytelling. Angèle Diabang blurs the boundaries of the two in Yandé Codou, the Griotte of Senghor (2008), recounting the life of this mythical figure, “the only one who could interrupt Leopold Sedar Senghor’s speech with a song of praise”. Yandé Codou Sène, born in 1932, is the haunting voice in many Senegalese films. Mossane by Safi Faye is perhaps one of the most stunning. Yandé Codou Sène's incantations introduce the beautiful Mossane as she baths in the mythical Mamangueth, and at the end, at the site of her tragic fate, she sings her praises. In her film, Yandé Codou Sène, diva séeréer, Laurence Gavron, naturalized Senegalese, originally from France, returns to the roots of the Serer Diva. 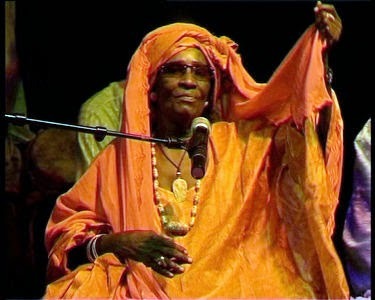 Carrying on the tradition of the griot, the voices of Senegalese women continue to be heard and seen, and while Yandé Codou Sène has parted, her unforgettable voice will remain with us always. Excerpt from the 21 June 2009 post on African Women in Cinema Blog, "The Evolution of Senegalese Women in Cinema." MY NOTES: And there is "Karmen Geï" by Joseph Gaï Ramaka. The film ends with the appearance of Yande Codou Sene, the blued-lip praise singer, along with Doudou Ndiaye Rose and his orchestra. Here, too, she sings praises to the heroine, Karmen, during her frenetic escape to avoid the death that awaits her. Yandé Codou Sène is a true representative of Serer culture and that is why the Poet-President, Leopold Sedar Senghor, chose her to accompany him during important events. Because she is the celebrated singer who Senghor knew in the region of his childhood…in the Sine… Diofior, Joal, Fatick. This region that he calls the kingdom of his childhood…where he was initiated at a very young age to Serer song and poetry. This region, its traditions, is represented by Yandé Codou Sène.